Unfortunately, you cannot simply pluck buds off your plant and smoke or use them right away. At the very least they need to be dried before they can be smoked smoothly, and even then your buds are not at their full potential. It takes the process of slow drying and curing (storing buds in jars for at least 2 weeks) to get buds that are smooth, smell like they did when they were growing, and to reach their full perceived potency. 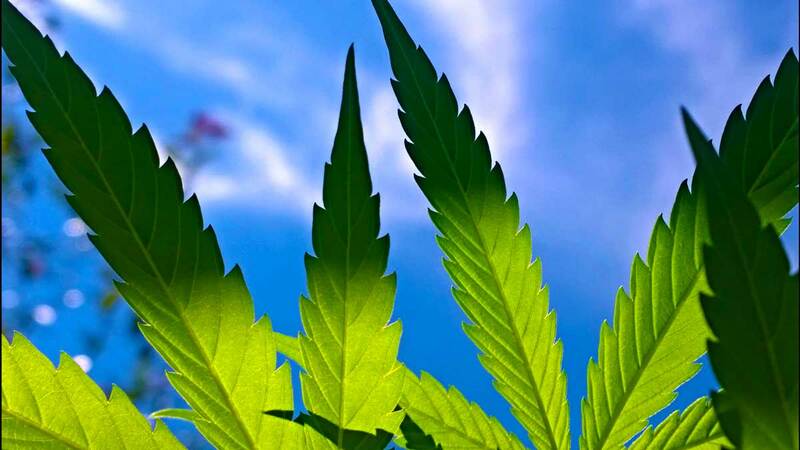 Buds that have been dried quickly or haven't been cured often give you a headache, may smell like hay, may be harsh on your lungs, and just don't feel as potent. 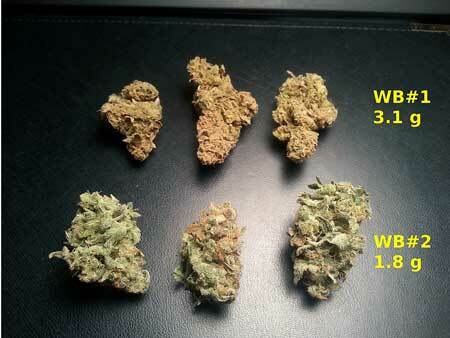 The quality of your buds improves almost exponentially during the dry/cure! So much so that I'd estimate drying/curing makes up 50% of your final bud quality. Don't skip this step! Drying: Dry buds for 4-10 days. 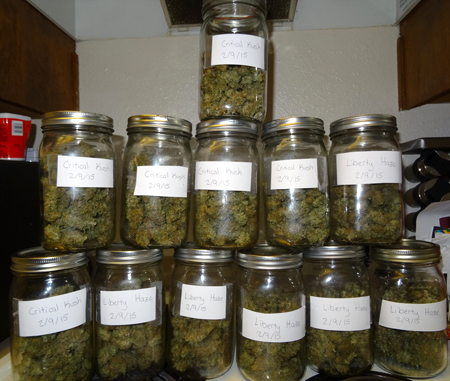 Start Curing: Put buds in glass jars and open daily. Buds should never feel wet or stick together. 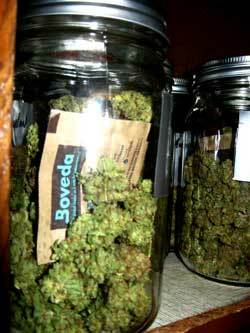 Continue to cure buds for 2-4+ weeks (while opening jars occasionally) for as long as you want, up to 6 months. Buds continue to improve for several months. Try to keep the temperature between 60-75°F if you can while they're drying. You want the humidity around 50% in an ideal world. If you have around 50% humidity, I recommend trimming the buds first to remove most of the leaves, then hanging them upside down to dry. This is the "standard" way to dry buds. If the humidity is higher than 60%, keep the temperature closer to 75°F. This helps prevent mold and also helps the plant dry a little faster in high humidity. 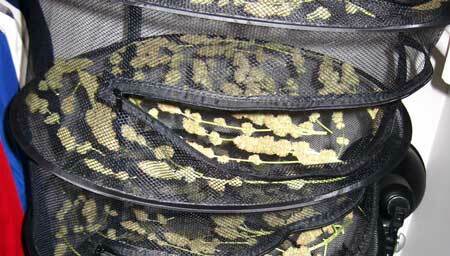 If you have high humidity, you might also consider cutting your buds from the stem and drying them on a mesh rack. The more plant you cut away before drying (whether it's leaves or stems), the faster the buds will dry. If the humidity is lower than say 40%, keep the temperature closer to 60°F if possible. This just helps it dry at the best rate since plants dry slower at a lower temperature, and you want to try to slow things down in low humidity.. Under 40% humidity, I also recommend leaving the leaves on the buds while they're drying to help prevent them from drying too fast, then trimming the leaves off after they've dried. You don't want stagnant air while drying, but pointing a fan at your buds or even a wall in the drying space can sometimes dry buds out too fast. 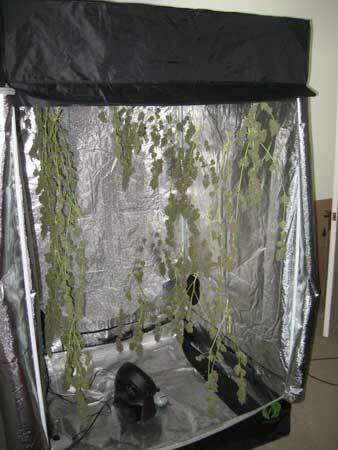 I've had good luck drying in my grow tent or in a closet with the door open. I try to make sure no buds are ever touching each other, and they all have at least an inch or two of air to themselves. If you've got a lot of dense bud drying in a relatively small space you may need to use fans because the humidity will rise quickly. Especially your first grow, check on your drying buds often to make sure they're not getting too dry too quick or growing mold. After your first few times you'll get a feel for what you need to do in your specific environment. In a grow tent - I always keep the doors open to make sure there's some amount of air circulation while buds are drying, but you should clean the room first so you don't get any fibers on your buds! 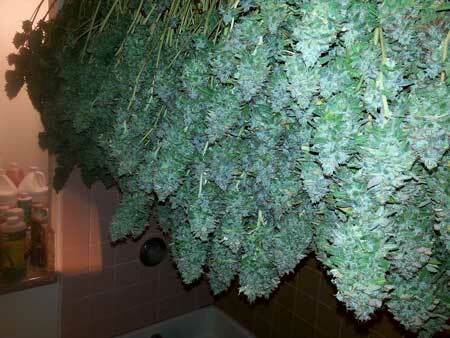 Don't let buds touch each other when drying as this makes it a lot more likely to get mold! 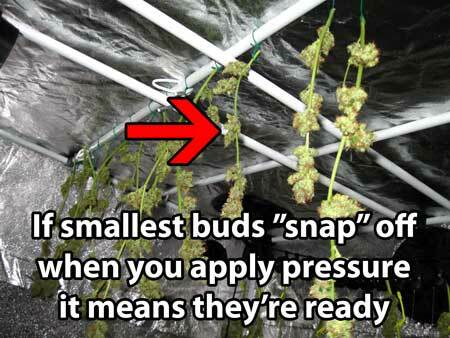 When buds are done they'll feel completely dry on the outside. The stems will snap instead of bend and buds pop off on their own without leaving strings behind. This means they're done drying and should be put in jars. If buds were completely separated from the stems during the drying process, they're ready as soon as the outsides feel dry to the touch. I recommend using glass quart-sized mason jars for curing (which you can find at grocery stores, cooking stores, Home Depot, Wal-Mart, craft stores, etc). 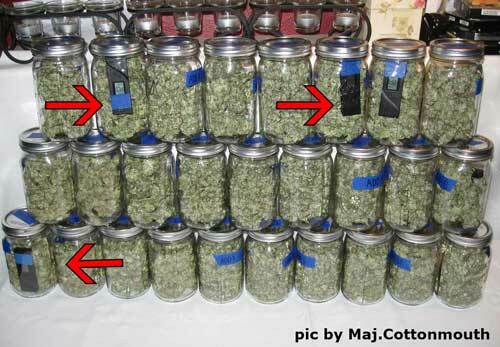 Once the buds are sealed in jars you should open the jars once a day for at least the first 1-2 weeks, and buds should stay in jars for 2-4+ weeks for the best results. The slow drying is the beginning of the "curing" process, but the jars will greatly increase the smoothness, smell and overall perceived potency/quality of your buds. When checking on buds, always make sure they feel dry to the touch (if they feel wet keep the jars open for an hour or two). If you smell ammonia or they stick together when you shake the jars, that also means they're too wet and need to be dried out a little. If they feel bone dry only open jars once/day and don't let lids stay off for long. Often there is some amount of moisture contained in the buds that will work itself to the outside of the bud while they're in jars. If you think you've overdried your buds, don't panic! They'll often soften up over the next few days and even if you did completely overdry your buds they will still benefit from the curing process. This is completely not necessary but if you want to get super technical you can get a hygrometer (humidity tester) to put in your jars to monitor the humidity. You ultimately want around 60% RH in the jars. If you're having trouble getting the humidity right, many growers use Boveda 62 Humidipaks which automatically stabilize the RH at 62%. Example of Boveda Humidipak in a jar - these little packs are designed for curing cannabis automatically helps regulate the humidity so it stays where you want. However, they won't dry out your buds if they're really wet so you do need to dry buds first. 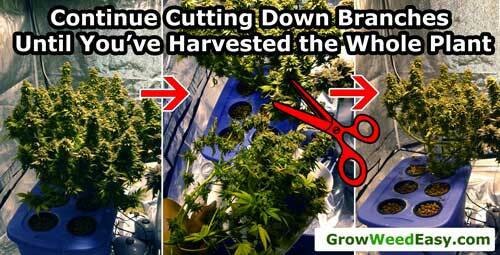 They are really great for preventing buds from drying out and will lower the humidity a little if it gets too high. They also seem to help prevent mold and can be a great choice for long-term storage. How much difference does the humidity inside the jar make? Check out one grower's experience with "high humidity" curing vs "low humidity" curing buds! Mold is the number one enemy of drying and curing. The problem with mold is it makes buds unusable While buds are drying, check on them twice a day just to make sure that they aren't growing mold. This is more likely to happen at high humidity and when the temperature is between 60-70°F, or when the air is stagnant. If you ever see mold, increase air circulation, raise the temperature to at least 75°F and bring the humidity under 40% if possible. This will stop mold in its tracks. Drying too fast or too much is the number two biggest problem with drying/curing. 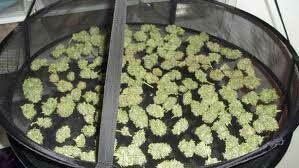 Avoid low humidity or temperatures over 75°F while drying because that environment will dry your buds too fast. Buds need to dry slowly or they won't cure properly. Uncured buds often have "wet grass" or "hay" smell, aren't as smooth to smoke, and don't feel as potent when it comes to effects. Your buds should take at least 4 days to finish drying because otherwise the outside dries too fast, which makes the curing process less effective so it takes longer. It's better to take your buds down a little early and finish drying them in jars than risk drying them too much. Just make sure you're always on the lookout for mold and follow all the other steps! I'm in a hurry. Why can't I quick dry buds? Buds in jars are getting too moist, what do I do? That you all do so well. yes, I second that! Nebula's process works for me, no question about that. I give all the credit to my three successful grows to the folks at GWE and those who participate in the forums! Invaluable. I live in a place where mold can be rampant. And dry my buds at 45% humidity with a little air circulation. Takes about 4 days if I don't water the plants for three days before harvest and about 5-6 days if I water them within 36 hours of harvest. so far so good. Thanks to all! What some great information again, but Nebula knows what she is talking about ,I have never seen such a wanting to help people as much as Nebula. Like Zigzag said don't water before harvesting, buds are properly dried in 4 to 5 days.